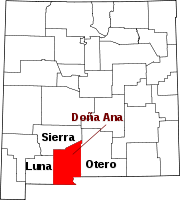 Doña Ana County is a county located in the southern part of the State of New Mexico of the United States. As of the 2010 U.S. Census, its population was 209,233, which makes it the second-most populated county in New Mexico. Its county seat is Las Cruces, the second-most populous municipality in New Mexico. The county is named for Doña Ana Robledo, who died there in 1680 while fleeing the Pueblo Revolt. Doña Ana County consists of the Las Cruces, NM Metropolitan Statistical Area, which is also included in the El Paso-Las Cruces, TX-NM Combined Statistical Area. Doña Ana is pronounced Doh-nya Ahna [ˌdoɲa ˈana], fast speech [doˈɲana]. It borders Luna, Sierra, and Otero counties in New Mexico, El Paso County, Texas, to the east and southeast, and the state of Chihuahua, Mexico to the south. As of the 2000 United States Census, there were 174,682 people, 59,556 households, and 42,939 families residing in the county. The population density was 46 people per square mile (18/km²). There were 65,210 housing units at an average density of 17 per square mile (7/km²). The racial makeup of the county was 67.82% White, 1.56% Black or African American, 1.48% Native American, 0.76% Asian, 0.07% Pacific Islander, 24.74% from other races, and 3.58% from two or more races. 63.35% of the population were Hispanic or Latino of any race. Doña Ana is a Democratic-leaning county in Presidential and Congressional elections. Since 1920, Doña Ana has voted for the candidate who also won statewide, the only exception being in 2004 when Democrat John Kerry won Doña Ana 51–48%, while Republican George W. Bush won statewide 50–49%. The last Republican to win a majority in the county was George H.W. Bush in 1988. In 2008, Democrat Barack Obama won 58% of the county's vote. Doña Ana is part of New Mexico's 2nd congressional district, which is held by Democrat Xochitl Torres Small. In the State Senate Doña Ana is part of the 31st, 36th, 37th, 38th, and 40th Senate districts, which are held by Democrats Joseph Cervantes, Jeff Steinborn, David Soules, Mary Kay Papen, and Republican Bill Burt, respectively. In the State House Doña Ana is part of the 33rd, 34th, 35th, and 52nd House districts, which are held by Democrats Bill McCamley, Belaquin Gomez, Angelica Rubio, and Joanne Ferray, respectively, the 37th and 53rd House districts, which are held by Republican Ricky Little, respectively, and the 36th House district, which is held by Nathan Small. Current County Commissioners are as follows: Lynn Ellins (District 1), Ramon S. Gonzalez (District 2), Shannon Reynolds (District 3), Isabella Solis (District 4), and VACANT (District 5). In January 2012, a Federal court awarded former County prisoner Stephen Slevin a $22 million award for inhumane treatment and for keeping him jailed for 2 years without a trial. In a radio interview on the Canadian Broadcasting Corporation program As It Happens broadcast February 7, 2012, Slevin's lawyer indicated that he was arrested for "DWI". During his incarceration, Slevin was placed in solitary confinement. When his health deteriorated, Slevin was removed to a hospital, but after two weeks in the hospital, he was returned to solitary confinement. The lawyer stated that pictures taken before and after Slevin's time in jail were key to the trial's outcome. The District Attorney for the 3rd Judicial District in Doña Ana County during the 2005 - 2007 indefinite detention without trial of Mr. Slevin was Susana Martinez, the current Governor of New Mexico. After careful review of New Mexico's laws it is clear that the state's marriage statutes are gender neutral and do not expressly prohibit Doña Ana County from issuing marriage licenses to same-gender couples. Any further denial of marriage licenses to these couples violates the United States and New Mexico Constitution and the New Mexico Human Rights Act. Doña Ana County is upholding New Mexico law by issuing these marriage licenses, and I see no reason to make committed couples in Doña Ana County wait another minute to marry. Several Republican state legislators vowed to file suit against Ellins in a bid to halt the licenses from being issued. ^ a b "State & County QuickFacts". United States Census Bureau. Archived from the original on July 9, 2011. Retrieved September 29, 2013. ^ "Doña Ana Historical Marker". The Historical Marker Database. Retrieved June 3, 2018. ^ "Lonely hell of long forgotten prisoner Stephen Slevin". The Telegraph (AU). January 29, 2012. Retrieved January 28, 2012. ^ Mears, Bill (January 25, 2012). "Former inmate wins $22 million over 'forgotten' solitary confinement". CNN. Retrieved January 28, 2012. ^ "Meet the Governor." New Mexico Office of the Governor Susana Martinez. January 29, 2012. ^ "ELLINS: DOÑA ANA COUNTY ISSUING SAME-GENDER MARRIAGE LICENSES". Doña Ana County. August 21, 2013. Retrieved August 26, 2013. ^ "GOP to challenge state's gay marriages". Santa Fe New Mexican. August 22, 2013. Retrieved August 26, 2013. Wikimedia Commons has media related to Doña Ana County, New Mexico. This page was last edited on 8 April 2019, at 01:12 (UTC).